Lego DC Comics Superheroes: Justice League – Gotham City Breakout (2016) – What's New on Netflix Canada Today! Fighting crime is a full-time job and Batman NEVER takes a vacation. 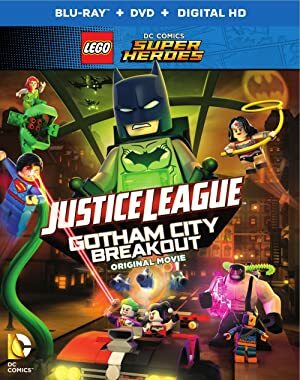 That is until he finally agrees to let Batgirl and Nightwing take him on a long overdue trip – leaving Gotham City under the watchful eye of the Justice League in LEGO® DC Comics Super Heroes – Justice League: Gotham City Breakout. When Batgirl and Nightwing take Batman on a trip down memory lane – literally – to visit one of the key mentors from his formative years, it’s up to the Justice League to keep Gotham City crime-free. But neither situation proves to be a “vacation” as the Bat trio encounters old nemeses on their adventure, and the Justice League discovers just how busy Batman is on a regular basis. It’s a brick-tastic battle on two fronts as Batman, Batgirl and Nightwing take on Bane and Deathstroke, while the Justice League – with some help from a few Teen Titans – fends off an assault by many of Batman’s infamous adversaries to ensure Gotham City’s safety.